Consumer security cameras have become a huge product category in the last couple year with the likes of Google, FLIR, and Logitech taking a swing at home monitoring. Your options are greatly reduced if you need a camera that operates for long stretches on battery or in the great outdoors. This is something Netgear has attempted to address with its Arlo security cameras. The new Arlo Pro adds a few features to the lineup, bringing it to parity with standard wired cameras. However, the wireless aspect means you'll have to make some compromises. Completely wireless No power cable, so you can put Arlo anywhere around the house. Weather-resistant Works outdoors and at temperatures as low as -4F. It passes the Minnesota winter test. Local storage USB ports on the hub for as much local video backup as you want. Battery life Should run for months on a charge. Audio Loud and clear enough to carry on a conversation. Plans Free tier includes 7-days of online video. Paid plans are reasonable too. Video It takes five or six seconds to start the feed live, and has a three-ish second delay on the video. Field of view is a little narrower and video quality (720p) isn't as good compared to competitors. Mounting Doesn't come with a regular stand, only wall mounts. Additional mounting accessories are a bit pricey. App Too many bugs. Fails to start feeds and audio on occasion. Notifications are confusing to set up, and geofencing is unreliable. 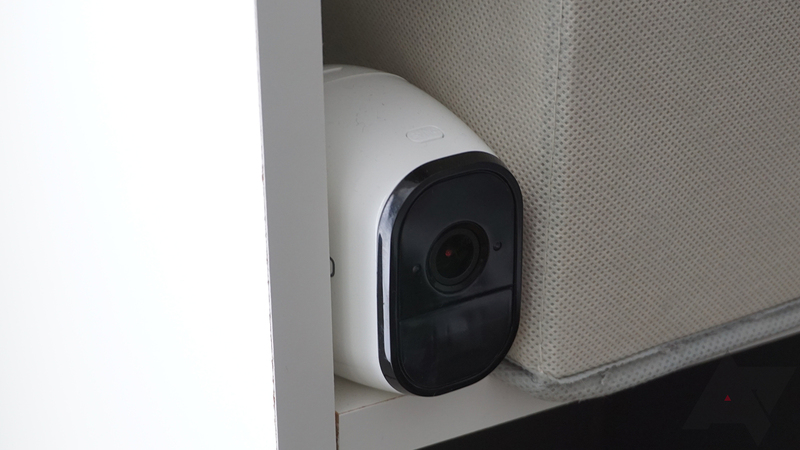 The main thing to keep in mind when evaluating Arlo pro for use around your home is that it's completely wireless. That means you can put it pretty much anywhere without worrying about access to power, but this comes with a few important design concessions. First and foremost, you're dealing with more than just the camera. 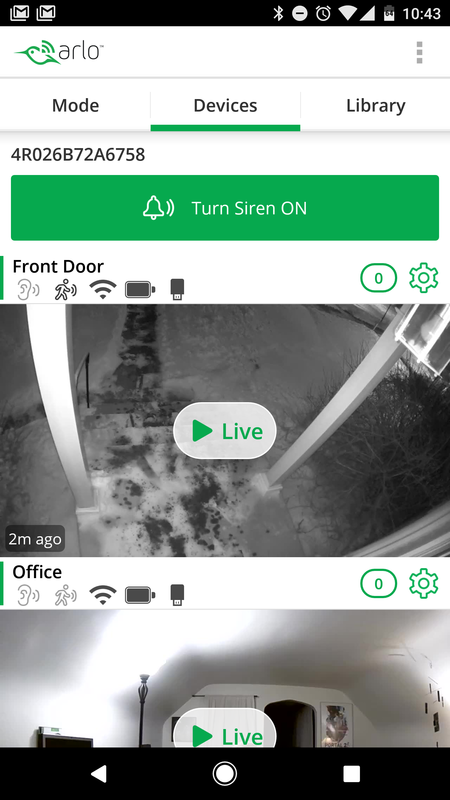 When you buy an Arlo Pro system, you get 1-4 cameras and a hub that they connect to. The hub is necessary because the cameras don't connect to your WiFi network directly. The hub also has a very, very loud siren you can activate. 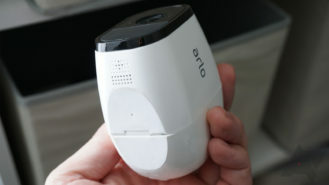 In the interest of conserving power, Arlo Pro uses a low-power 2.4GHz WiFi network of its own to link up the cameras. That's managed by the hub, which needs to be hardwired to your router. However, you should not have it right next to your router. 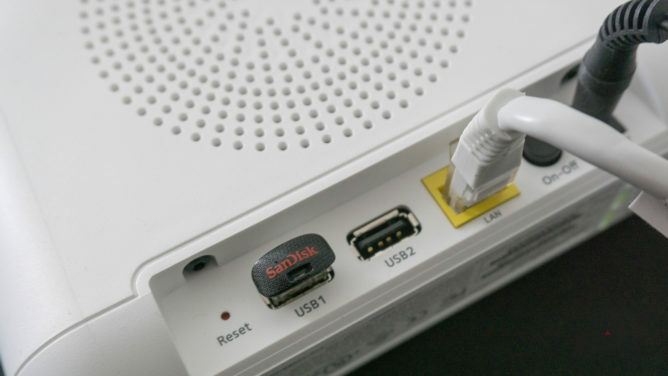 The interference with your standard network can cause connectivity issues for the cameras. On the rear of the hub is something very cool—two USB ports. You can plug in some thumb drives here for essentially unlimited local storage of your video. All recorded clips are saved there in addition to being uploaded. 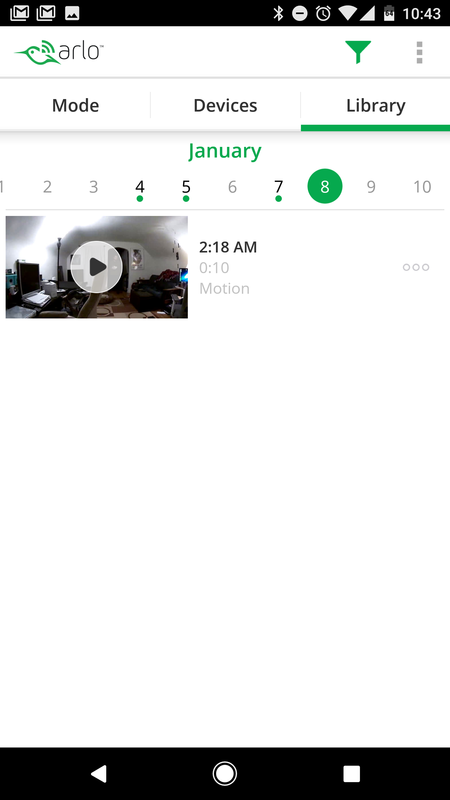 You can also have the hub record over old videos when space gets low, or pop in a new one. Even a small USB drive will last you ages, though. 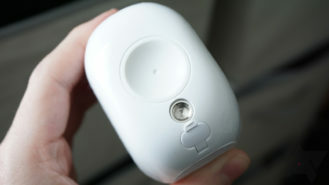 The cameras are compact white pods with a flat base on the bottom. The front is black with the camera lens and IR lights for night vision. Tucked underneath the front panel are the speaker and microphone. On the back is a screw-in mount, a magnetic mount, and the sealed microUSB port. On top is a sync button for connecting the camera to your hub and a button that opens the frame so you can install or replace the battery (you should not have to use this often). You may notice there are a lot of mounting options on the camera. It only comes with a magnetic wall mount, though. The rubberized base acts as a stand, but it's flat with no ability to tilt. This is annoying—the camera should at least come with a simple stand so I can put it on a shelf and point it in the direction I want. They sell various mounts that are exactly what I want for an extra charge. 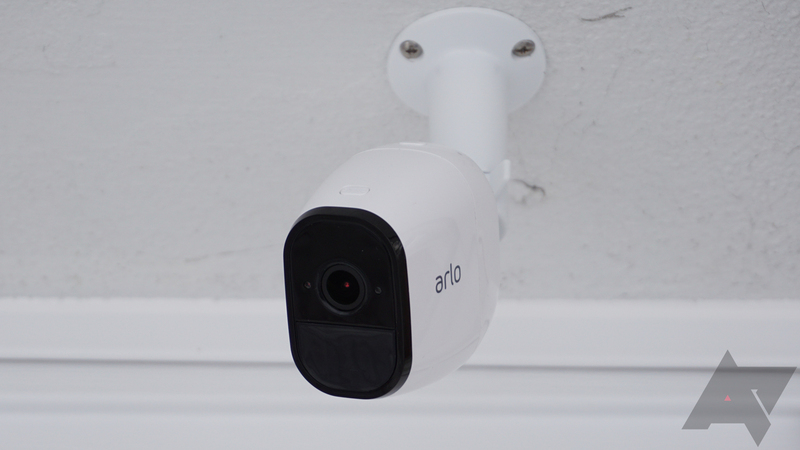 One of the best things about Arlo is that it's weather-resistant (IP65) and can operate at temperatures as low as -4 degrees Fahrenheit (-20 C). There are a few weather-resistant cameras that can't even hit zero, which makes them essentially useless for me in Minnesota. I've had an Arlo Pro outside for a while now, and it's holding up in temperatures right at (and a little below) the rated level. The lack of wires means you can put the camera anyplace outside. In a tree, mounted over the door, hidden in your mailbox to surprise the mailman—anywhere. The 2,440mAh batteries are supposed to last you a few months. For cameras that are inside or kept in not too chilly outdoor conditions, I think that's accurate. The camera I have inside has barely dropped at all in 2 weeks of light use. When it's cold, batteries are less efficient. And I suspect this is the limiting factor for the camera's weather resistance. I left the Arlo Pro outside overnight when it was around -4 degrees and the battery lost 15% of its charge. If you have a run of very cold days, you might have to charge the camera sooner than expected. I also accidentally left the camera outside once when it was -10 overnight (the forecast was wrong! ), and it stopped working. I had to bring the camera inside before it came back to life. That's not a knock against the hardware, just information you should know. Getting Arlo set up wasn't bad, but it certainly isn't as smooth as Logitech Circle. You have to press the sync button on your hub and camera, then watch the LED codes to make sure they see each other. It took a few tries before I got it. 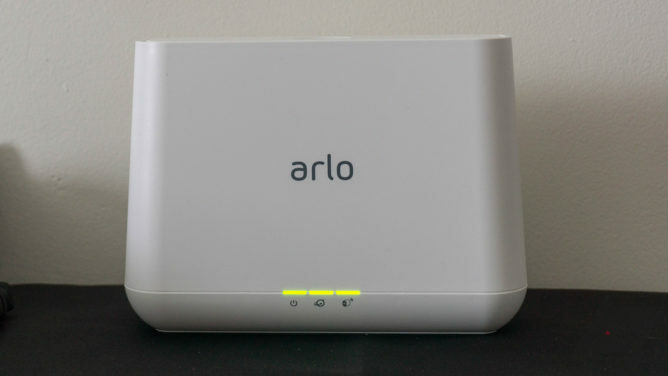 Another concession you have to make with the Arlo Pro is that it won't do 1080p video because of the low-power wireless connection. It tops out at 720p, and it's a bit more compressed than the video you get from most cameras. The upshot of this is that the video doesn't consume as much bandwidth when it's uploaded to the cloud. I've got a sample embedded (on the highest quality setting) below so you can judge for yourself. My biggest gripe with the Arlo Pro is how slow it can be. When you open the app, the video isn't going to stream immediately. 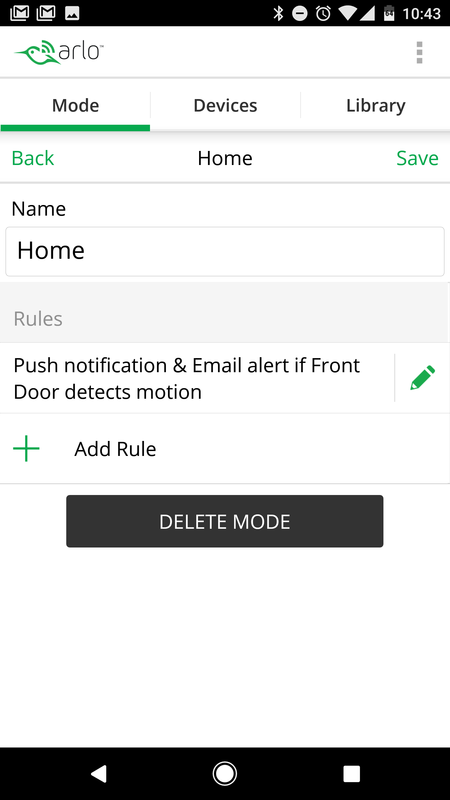 Arlo only streams live when you tell it to, but it will still turn on and record when triggered by motion or sound. It takes about five seconds to activate the live stream, and the stream remains on a roughly three-second delay while you're viewing it. I understand that this is because of the wireless system, but it's still annoying. Arlo Pro has a 130-degree viewing angle, slightly narrower than other cameras. However, it's very flat with no fisheye distortion at the edges. The night vision is solid, and has a range of about 25 feet with the array of IR LEDs on the front. It illuminates my entire office and all the way down to the sidewalk outside my front door without issue. The aforementioned compression is more obvious in night vision mode as the image is darker. It still looks alright, and you can tell what's going on. If you compare it to night video taken on the Logitech Circle, the difference is clear. Netgear added audio to this camera, which the last wireless Arlo didn't have. The delay is only about a second, much shorter than the video. It's good enough to carry on a conversation, but the audio comes out sounding rather robotic. I'd chalk this up to the completely wireless aspect and saving power. I've mentioned a few annoyances with the Arlo Pro above, but I don't now how much of that is the hardware and how much is the app. Arlo's app isn't my favorite. The basic design isn't bad—it opens on a scrollable list of your feeds with tabs at the top to set the security mode and view your library of recordings as well. My main issue is that it's just buggy. Sometimes the app refuses to load a feed after about 10 seconds of trying. Another attempt and it loads fine. Likewise, the audio button fails to work on occasion. It also has a tendency to say my cameras are offline, but when I restart the app they're magically online again. The way you configure your modes is also really confusing. It's fine once you learn what's what, but even then I have some issues. For example, geofencing is a beta feature, and it's earned the name. It constantly selects the wrong security mode. If I had the siren set to go off in away mode, I probably would have deafened myself by now. As I mentioned above, notifications are a little complicated to configure, but you do get a good selection of options. When a sound or motion of your chosen intensity is detected, you can set a camera to record a video with configurable length and push you a notification. You can also have videos emailed directly to you for each alert. This saves you from opening the occasionally buggy app as much. The storage plans are another nice feature of Arlo cameras. The offline storage is great, but to access the data easily from anyplace, you want it online. Netgear will keep your video for 7 days (maximum 1GB, which is plenty) at no charge. For $10 per month you get 30 days of recordings (up to 10GB). $14.99 gets you 60 days of recordings and up to 100GB of storage. Each tier also has a limit of five, ten, and fifteen cameras, respectively. The long free retention time makes Arlo Pro one of the better choices if you're dead-set against paying extra every month. The Arlo Pro has several very strong selling points. The completely wire-free design allows you to place them wherever you want and the battery life is amazing. The weather-resistance and cold tolerance makes it a viable product in colder areas like my abode in Minnesota. The free plan also offers a week of storage, which I appreciate. If that's not enough and you don't want a subscription, Arlo Pro's hub has USB ports for essentially unlimited at-home backup. The video and audio quality is good, not great. The delay in starting a stream is irksome as well. This is down to the power-saving design, so it's a trade-off. I'm less enthused about the app, which has too many weird bugs for an established company like Netgear. The notifications are confusing, cameras sometimes fail to load, and sometimes the app incorrectly reports offline status. If Netgear can fix the app, I think it would be a much more compelling product. That said, the app does have plenty of features. It checks all the boxes, though not always effectively. There are no deal-breakers here, I think. The annoyances I mentioned are just that—annoyances. 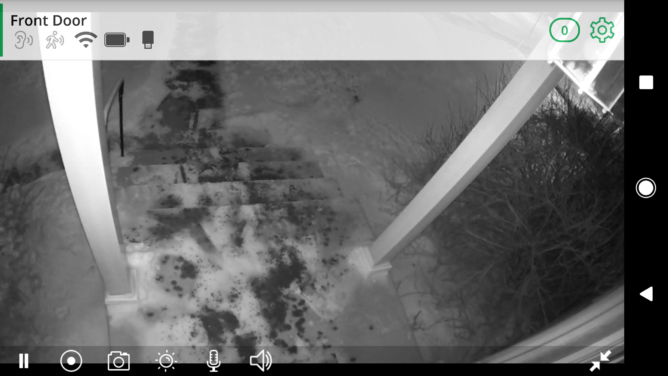 I still quite like the Arlo Pro because it has a use case. If you need a completely wireless camera that you can move around or put outside, this might be perfect. However, if you mainly need indoor cameras and have access to power everywhere, there are other options that offer many of the same features with better apps and video quality. If you want to pick up Arlo pro, it's available from Amazon, Newegg, and other retailers.